ALL CLASSES CLOSE ON MONDAY OCTOBER 8th! have been changed to $100,000 Amateur classes. 100,000 lifetime earnings as of Jan 1st, 2018, no roll backs & no exemptions. $5,000 Added 4 and 5/6 Unlimited Amateur Go-round will run concurrently with the Unlimited go-round - Separate Finals! 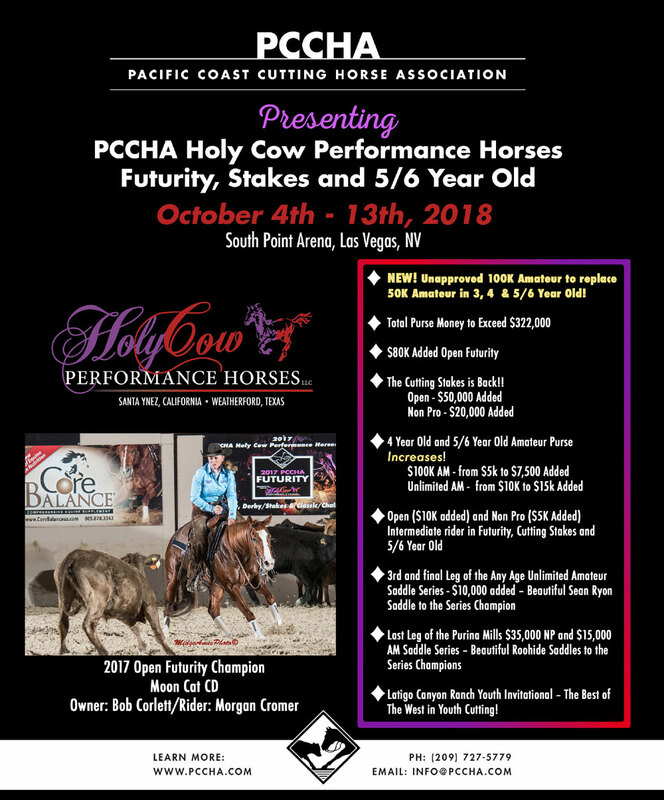 AT THE PCCHA Holy Cow Performance FUTURITY! A Special Thank you to Cookie & Katie Banuelos for sponsoring the 5/6 Goldens! See everyone at the South Point! Schedule Revised 9.27.18 please take a look!